Mains electric, water and drainage are connected with gas located in the yard to the front. 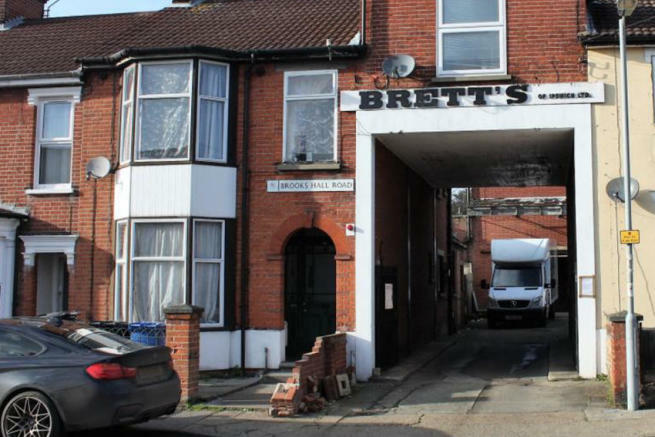 The property comprises a two storey warehouse of solid brick elevation under a pitched roof. Access to the building is via a sliding wooden loading door with built in pedestrian entrance. Within the ground floor area of the warehouse is a kitchen and wc facility. Serving the first floor is a goods lift to the rear of the building and the main staircase at the front. The upper parts also benefits from an overhead crane to assist with moving of heavy items. Access off Brooks Hall Road is via a gated entrance and under a high archway which can cater for fixed trailer lorry access. The property is located in the middle of Brooks Hall Road, close to the junction with Waterloo Road. This position is close to the busy feeder roads of Norwich Road and Bramford Road giving access to the main town centre, the suburbs of the west side of Ipswich and the A14. Brooks Hall Road is primarily a residential area with the warehouse being located behind the residential terrace. The front of the property is parking for approximately 3 vehicles behind the gate. 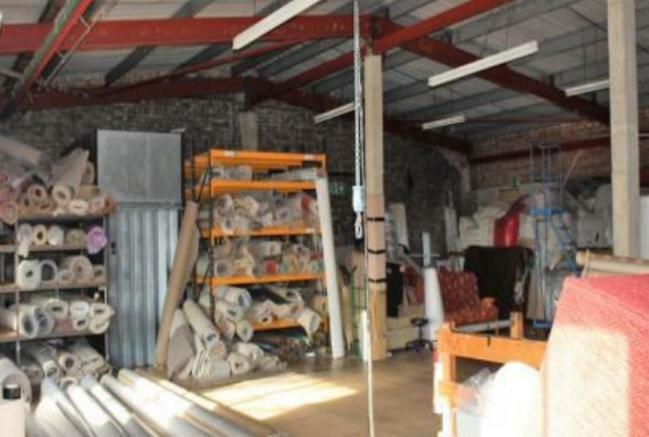 Note: There is a further area included to the side of the unit needing refurbishment which could be ideal for more storage or under cover parking which benefits from a ground floor area of 30 sq m/323 sq ft. The premises are available by way of a new lease, length to be agreed, subject to a proposed commencing rent of £30,000 per annum exclusive. Alternatively the freehold is available offers sought In the region of £300,000. VAT is applicable to this property. Rateable value £15,750.00 per annum. Rates payable for 2018/19 using poundage of 49.3 p are £7,764.75p. Note: we strongly recommend any interested party carry out their own investigation with Ipswich Borough Council Business Rates Department for confirmation of the rateable values and poundage that would be applicable to their business and if you are eligible for small business rates relief. We understand from Ipswich Borough Council the property benefits from B8 Storage and distribution use. For further uses please contact Ipswich Borough Council, planning department. Property reference 42_Brooks_4848_IP1. The information displayed about this property comprises a property advertisement. Rightmove.co.uk makes no warranty as to the accuracy or completeness of the advertisement or any linked or associated information, and Rightmove has no control over the content. This property advertisement does not constitute property particulars. The information is provided and maintained by Reader Commercial, Ipswich.